We are A2B Assessments. 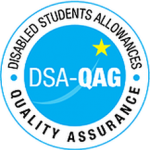 We offer positive, supportive and informative DSA Needs Assessments that help you succeed at University and beyond. We currently have centres across London and Reading. If you’re not ready to book your assessment and need help with your application please click on our free application guide. "I was made to feel really comfortable and at ease - something that often feels forced by such meetings, but could both relate to and trust who I was speaking with. Helpful suggestions for my help also provided." "I found the whole experience with A2B great and the advice really helpful. They made me feel totally relaxed and answered all my questions clearly and with a good amount of detail. It was all a very new experience for me which they completely empathised with whilst also listening to all of my concerns. Thank you very much A2B for showing me that there is so much software out there to help me make the most of my postgrad course." "A2B Assessments personally ensured that the DSA process for me was quick, easy and efficiently done. The assessor was very friendly and was willing to answer any queries I had which made the process much easier while also making me feel relaxed and willing to answer any questions; making it more like a conversation rather than an interview. The appointment was made shortly after I arranged it online - no longer than 20 mins later and I was seen 2 days later. I would thoroughly recommend A2B Assessments to anyone who is entering the DSA process." Nathan completed a BSc in Finance at the University of Reading before undertaking his Masters at Central St Martins (UAL). It was during his Masters that Nathan first became aware of the DSA process, receiving support as a student himself. Before graduating Nathan began training as a Needs Assessor and over the following 6 years also worked as a DSA Assistive Technology Trainer and Specialist 1:1 Study Skills Tutor. ​Outside of running A2B, Nathan enjoys going to the theatre, the gym and the great outdoors. Ed read Philosophy and Film at the University of Kent before studying a Masters at Central St Martins (UAL). After his studies, Ed started working as a DSA Assistive Technology Trainer before also undertaking Specialist 1:1 Support covering both Study Skills and Mentoring. Ed’s experience in these different areas of the DSA, helped him to understand a broad range of disabilities and the individual support students can require. ​When he is not making sure A2B is running smoothly, Ed enjoys cycling, going to the cinema and rock climbing.